Probably the most acclaimed resort surrounding the Lake Tahoe, Squaw Valley oozes of fun, sun, and fantastic skiing. Once a famed organizer of the 1960 Olympic winter games, the resort has clearly taken pride in upholding a high service level. Since the merger with Alpine Meadows ski resort in 2012, the combined Squaw Valley ski resort is now easily regarded as the most diverse ski resort around the area of Lake Tahoe. Squaw Valley ski resort is considered the home of extreme skiing in America. It is the perfect place for free-riders and expert skiers. Despite being an impeccable location for intermediate and expert skiers, the resort also offers activities suitable for families and beginner skiers. The resort is well-connected thanks to the 42 different lifts that include 2xgondolas and trams, 5x high-speed sixes, 1xquad chairs, 5xhigh-speed quads, 12xtriple chairs, 10x Double Chairs, and 7xT-Bars. These lifts help skiers get easy access to different slopes and the terrain parks. Squaw Valley has over 6000 acres of skiable terrain and 233 runs with the longest run measuring 3.2 miles long. It gets plenty of snow in winter right at the start of the season. But any difference in the quality and quantity of snow is covered by its modern snowmaking machines. The Squaw Valley Ski Resort is one of the top-rated ski resorts for experts and freeride skiers. Overall the resort ranks at number 4 in North America. The resort became a popular spot for extreme skiers in 1984 when an American filmmaker Warren Miller taped Scot Schmidt’s 100-foot jump from Palisades. Since then, the jump known as the “Schmidtiots” was born to challenge any expert skier. The snow conditions at the resort are exceptional because of its high altitude. The snow’s depth and density allow expert thrill-seekers to try new stunts and tricks. 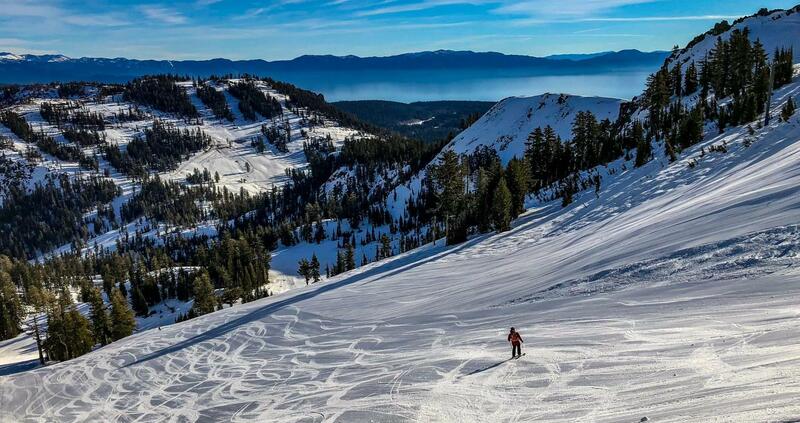 That’s why every powder hound’s dreams are fulfilled on a ski holiday in Squaw Valley. Skiing in Squaw Valley is different from every other resort in the U.S. because of the versatility of the pistes. The resort has massive powder bowls perfect for intermediate, expert and even beginners. The ski slopes are marked green, blue, red and mostly black for expert and advanced skiers. The skiable terrain is easily accessible by the modern lift system. The lifts are marked by different territories including beginners, intermediate and experts. Each lift is designed to take the skiers to their designated slopes. The highest elevation point at Squaw measures 9,050 feet. The sky-piercing peaks and massive bowls are treeless and the lower areas are wooded. From the expansive flat bowls to the steep runs at the KT-22 area for the experts, skiers and snowboarders have a lot of variety when it comes to the slopes and pistes. The resort also offers an opportunity for Night Skiing for those who want to ski under floodlights. They can do so by skiing on the massive 3.2-kilometer mountain run. The Riviera halfpipe and terrain park are open in the evening. The Riviera chairlift gives easy access to the terrain park and the Night Ski slope. Squaw Valley offers plenty of slopes for beginners too. Several green marked pistes are located on the upper mountain overlooking Lake Tahoe, giving beginners great views while learning to ski. The beginner area has five easy chairlifts too with expansive and gentle nursery slopes. The learning area at the Papoose is located in the lower mountain range at 6,200 feet. This area adds more terrain to the beginner area. The newly added two surface lifts give more access because they are located near the Far East Center. One of the highlights for intermediate skiers and snowboarders is the 3.2-mile long Mountain Run. The Run allows skiers to reach high cruising speeds from the top of the mountain as they rush downhill to the base of the resort. With the remarkable Lake Tahoe as the backdrop, skiing on the blue marked pistes is a real treat for intermediate skiers. Skiers can try the massive Siberia Bowl having several blue pistes located on the upper section of the mountain. Even though the Siberia Bowl is suitable for intermediate skiers, the steep slopes may still require some practice. Easy blue marked pistes are also located near the Red Dog and Squaw Creek. Skiers can then head to the expansive powder-filled bowls of the Gold Coast and the more popular blue marked slopes at the Shirley Lake. These areas are accessible by the Funitel and the Squaw One Express. KT-22 is the Mecca for expert and advanced skiers who love extreme skiing in Squaw Valley. Most of the skiable area of the resort is dedicated to expert skiers. Advanced skiers and snowboarders have a lot of expert terrain options including Headwall, Granite Chief, Broken Arrow and the Silverado Bowl. The hardest skiable area is the Moseley’s Run, a terrain of massive bumps and steep slopes. Some of the slopes near the KT-22 are double diamond blacks with giant bumps and steep slopes on the monstrous powder-filled bowls. Most of the terrain in the area is tough enough to test the endurance skills of some of the most experienced skiers and snowboarders. Other expert terrains at the Squaw Valley ski resort are Poulsen’s Gully, Headwall, Broken Arrow, and Granite Chief. These areas have abundant snow to keep thrill-seeking skiers occupied. Corniche II and Broken Arrow on the other hand have steeper pistes filled with chutes, gullies and powder-packed stashes. Squaw has a vibrant nightlife and spectacular après ski scene to suit every taste. The bars are always crowded filled with many skiers from within the U.S. and other countries. The après ski at Squaw Valley can be wild and rowdy or calm depending on what the skiers are in the mood for. The resort has vibrant lively nightclubs and mellow relaxing bars. The resort has plenty of options for après with excellent bars, serving local and international brands of beer and wines and outstanding pizzerias with drinks and cocktails. The Coffee Bar is very popular among the locals for its wide variety of drinks and Italian style coffee houses. The bar has an extensive list of wines and delicious food with natural organic ingredients fresh from the local farms. The Coffee bar is open from 07:00 am to 02:00 pm from Friday to Sunday. Auld Dubliner Irish Pub is based on the local cottage theme with authentic Irish fare and beers and wines of the highest quality. The bar offers the best cocktails and the Irish theme is interesting and engaging. The overall theme of the resort resembles a small Irish cottage giving it a very homely feeling for skiers. A relaxing spot for skiers to unwind, chit chat and prepare themselves for another day at slopes. The Auld Dubliner Irish Pub is open from 11:30 am to 09:00 pm Monday to Friday. On weekends, the bar opens early at 09:00 am to 10:00 pm. Bar One is considered as the central attraction for après ski at Squaw Valley ski resort. Most skiers especially the locals frequently visit Bar One because it has everything they need for a relaxing après ski. The refurbished fireplace, expensive bar, and breathtaking mountain views make it a popular après spot. The Cornice Cantina has two sides, during the day the restaurant and bar is a family-friendly spot with Mexican food and drinks that are affordable. Just as the sun sets, the Cornice Cantina is a completely different location. By nightfall the calm and quiet Cornice Cortina is a sprawling and sometimes rowdy après spot with every dancing and partying until 02:00 am. Squaw Valley has plenty of winter activities to keep the entire family occupied. The resort is popular for expert skiers but it offers plenty of other activities to make the holidays memorable for everyone. The aerial tram rides are a favorite activity for friends and family to enjoy the panoramic ride climbing over 2000 vertical feet. Expect breathtaking views of the Lake Tahoe in winter, the views of the massive snowy peaks of massive granite rock the iconic Tram Face. The tram’s last destination is at High Camp located at an impressive 8,200 feet. Rest at the High Camp enjoy the fresh mountain air in the mountains. Those with a Seasonal Ski pass can get the tram ride free. Non-pass holders have to purchase $46 per person for adults and $25 for children. The tram station is open from 9:00 am to 4:00 pm. Squaw Valley’s pool and hot tub are one of the most breathtaking and relaxing experience. The hot tub and hot pool are located at the High Camp. This is a chance to rest and unwind after taking the Aerial Tram Ride. The Hot tub is open for everyone aged five and up, the ticket costs $15 per person. The Hot Pool and Hot Tub are open from 11:00 am to 4:00 pm. Snow tubing is a thrilling and fun mountain adventure that every skier and non-skier can enjoy. Snow tubing slope is located at the SnoVentures Activity Zone located at the base station of the Squaw Valley near the parking lot. Snow tubing is a fun way to go downhill on a tube at fast speeds. The mini snowmobiles are a special treat for children when the weather permits. Kids age 6 to 12 can have a time of their lives on one of these fantastic machines. The snowmobiles are available at SnoVentures Lodge near the parking area. Snowshoe tours across the Squaw Valley’s snow-covered peaks and meadows are the best way to explore the beautiful resort. The trials at the Nordic Center are located near the Cross Country Ski and Snowshoe trials. The trails are perfect to see what the valley has to offer with different trails to choose from. The thrill and excitement of the Dog sleigh ride across the wonderful Squaw ski resort is one of the best and fun-filled activities for everyone. The dog sleigh rides are the best way to keep children busy; they will absolutely love the friendly and welcoming Alaskan Huskies. One sleigh holds about four adults and the tour route is 2.5 miles around the scenic meadows. Sky jumping brings everyone together, this fun-filled winter activity is perfect for anyone weighing 20 to 220 lbs. This is a chance to learn how to somersault and learn other stunts. The Sky jumping area opens at 10:30 am and closes at 07:00 pm. The Indoor Rock Climbing Wall is located at the Aerial Tram building, this activity is for adventure lovers seeking more thrill apart from the fantastic slopes. The center has indoor and outdoor walls for every climber. Children can learn to climb by taking lessons from trained professionals. The center is open from 12:00 pm to 05:00 pm. Popular ski resorts in USA Looking for ski trips and vacation packages to USA ski resorts? Have lots of fun skiing in USA!